Cellist Matt Cooker studied at the University of Michigan with Oliver Edel and Samuel Mayes. He has played in orchestras in Toledo, Ohio; Sacramento, California and the Orchestra della Scala in Milan, Italy. Matt is currently a member of the Hollywood Bowl Orchestra, and has been principal cellist of Los Angeles' Symphony in the Glen since its inception. 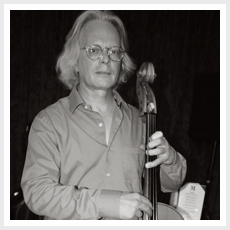 He has played in orchestras for diverse live artists (Barbra Streisand, Luis Miguel, Kenny G., the Scorpions, Stereolab, and AIR) and has been cellist for recent Sunset Strip rock artists (Anne McCue, Marcella Detroit, the Orphics and Lisbeth Scott). In 2003, he recorded the cello solos for Rolfe Kent's score to Freaky Friday, and returned from London after five performances of Carlos Rodriguez' Ex Machina for solo cello, with the Raiford Rogers Modern Ballet. He has worked on over 500 orchestra film scores, many television shows and records. Matt has taken classes at Yoga Works in Santa Monica for ten years, and in 2003, completed their Teacher Training Program.